We take pride in the property we market for our clients and our primary focus is to achieve the highest possible price in the quickest period of time. We are realistic with our valuations and timescales. 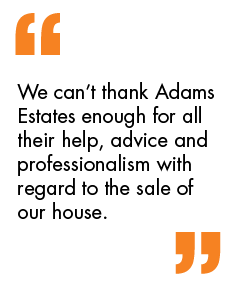 As a result our clients are pleased with the results and this is proven in the numerous testimonials we receive. So how does the process start and what are the main points to remember? Arranging a valuation is where it all begins. Our experienced sales team will have an honest discussion with you about the property and advise how we feel it will be best marketed so the highest level of interest is generated and the best price achieved in as quick a time period as possible. Once you give us the instruction to market the property, we will arrange for one of the team to visit the property in order to draw up a full scaled floorplan and take professional photographs. It also gives them the opportunity to inspect the accommodation so they are fully briefed and able to answer any questions prospective buyers may have. Once all measurements and pictures are taken, we will ensure the property is marketed online within 24 hours and advertised on our own website as well as the main property portals such as:- Rightmove and Zoopla. When the property hits the websites we will receive calls and e-mails from prospective buyers looking to arrange appointments to view. We ensure all relevant information is taken on each applicant when registered such as; whether they are an investor, if they have a mortgage agreement or if they are selling a property and are involved in a chain. After each viewing, we will contact you within 24 hours to give you detailed feedback. This is extremely useful to both you and us because it provides a clear understanding of what people think of your property and what, if anything, needs to be done in order to help its saleability. When an offer is received, we will inform you straight away both verbally and in writing. The prospective buyer will be qualified and you will be made aware of all information relating to the offer. We will offer our opinion on how we see fit to proceed with one or indeed several offers and leave the decision with you. Once an offer has been accepted we will confirm this in writing to both sides. You will then need to instruct a solicitor and start the conveyancing process. We work alongside several solicitors in Dewsbury and can happily assist in providing a quote from any if not all of them. When we have both parties’ solicitor details we will send you a memorandum of sale confirming all details relating to the sale. This will go also be sent to your buyer and both solicitors involved in the transaction. Once your buyer’s solicitor is satisfied with the replies to enquiries and all searches have come back, they will discuss a completion date with your solicitor and then arrange for the buyer to transfer their deposit. When the funds have been received and both sides have signed contracts, you are ready to exchange. At this point both sides are legally bound and completions will be soon to follow. On the day of completion, your solicitor will inform you that the remaining funds have been received from the buyer’s solicitor. They will then inform us we can release the keys to the new owner. We will put a friendly call in to congratulate you on the sale and wish you all the best for the future. Property sold!